Here is a piece of local history very few, even westsiders, know about. It relates to the very old Burgess log Cabin that sits right in the wooded wilderness of the Air Force Academy. It is accessible, but hidden from casual view by people visiting the academy. Even few cadets have ever encountered it. Westsider Steve Andrews is the great grandson of Bill Burgess who built that cabin. 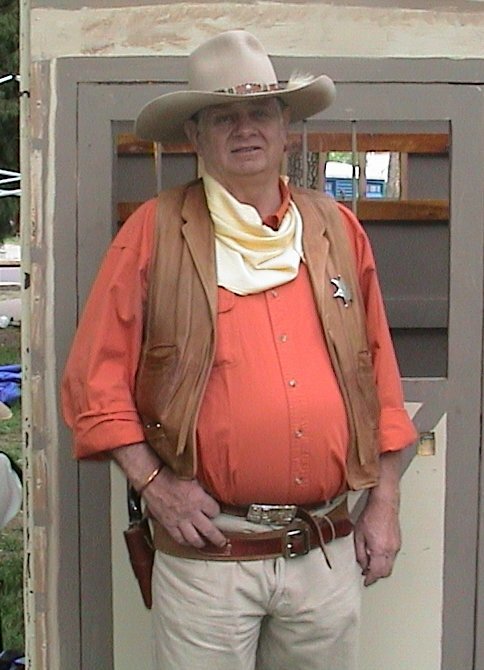 Steve is pictured here - all six foot five and 290 lbs of him - during Territory Days when he willingly played the role of the Sheriff for the reenactor Gun Slingers. Steve, who himself went to westside's Midland School as a boy of course knows most of his family's history. But we of the Old Colorado City Historical Society knew one story he did not. 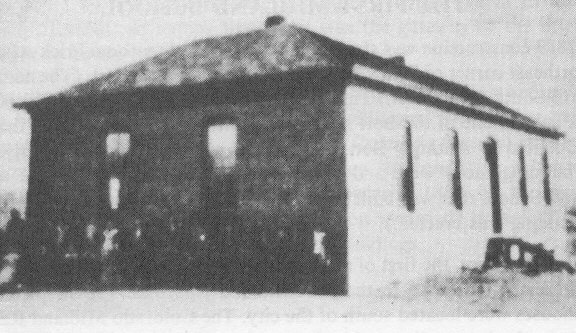 William Burgess came to the Pikes Peak Region in 1861 with his mother and filed a homestead of 160 acres in Douglas Valley - soon after 1859 Colorado City was founded, 10 miles further south. Bill cleared his land, and started building that very rustic cabin without nails, just notched logs with wooden pegs, and mud calking. It took him a long time by himself for he had also to scratch out a living. It was a one room cabin and had only a small loft and stone fireplace inside and of course no running water. Bill tried to make a living planting the little that would grow at that high altitude, cutting logs for the railroad, running an apple orchard, cutting ice, mining and other odd jobs. He labored in the hot summers and got snowbound in the winters typical of the pine tree wooded wilderness that is the westward extension of the Black Forest. Life got tougher even after he married Adeline, in 1880, and they tried to raise 5 children in that one room cabin. As the story was passed down, Adeline Burgess tried to make the few dollars that William brought in stretch to support the family.. But finally being a pioneer woman in such an isolated place got too much for her. She left Bill with their three girls, leaving him alone with two boys, his cabin and his dreams. They were Oscar, the oldest who had been born in 1882, and Harry, who was Steve's grandfather. Steve remembers his grandfather telling him stories about the tough life he and his brother had. He told of Indians, either Ute or Arapahoe who passed through the Black Forest. One day some came to the tiny cabin when Bill was gone to hassle their mother for food. The small boys, worried what the Indians might do, pulled down the family rifle from its rack. They, being so small, it took the two of them to manhandle the heavy gun, pull back the hammer, and hold it aimed at the Indian in the doorway. The Indians decided to leave. Other settlers in the dense Black Forest to the east were not as fortunate. Several were killed, scalped, kidnapped, or robbed by marauding Plains Indians. And Grandfather Harry told Steve of the worst whipping he ever got from his father when they lied about their mother showing up at the cabin to see them while he was gone. To try and make a living after his wife abandoned him Bill had to be gone a lot. The boys had to do lots of fending for themselves. They lived a Huckleberry Finn kind of life. Steve had not heard one story that linked the boys with Colorado City. Seems like they walked all the way to Colorado City - that 10 mile one-way distance - and 'hung out' for days at a time while going to the Midland School. Their father wanted them to have the rudiments of an education.. Apparently the bigger boy carried their rifle so they could shoot game on the way to and back. 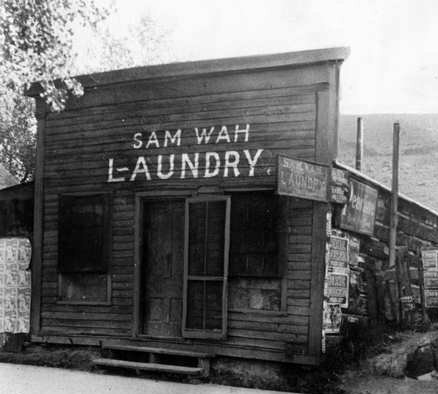 At one point they shot skunks, and delivered them to Sam Wah who operated a Chinese Laundry and Opium den in Colorado City in what is today's Bancroft Park Cabin. He paid the boys for the skunks, turning them into aphrodisiacs. It was probably as much cash money the boys ever saw. Where they lived during the days when they went to Midland school is unknown. Too far to go back to the cabin daily. Maybe they slept in barns. Who knows? They had no relatives in Colorado City. Sadly the older boy Oscar later died of cancer. Harry, the younger brother made it to adulthood, and told stories to grandson Steve - including the time they shot an Owl, which wasn't killed, just wounded. They put it under the bedcovers of a mean old Colorado City woman who gave them a hard time. When she went to bed she got bit. Their father never made a good living, and finally died in Denver in 1930. So that lonely Burgess Cabin still stands in the wilderness inside the Air Force Academy, which inherited it when they acquired the land. And where it has been preserved, cared for by the Academy, placed on the national Register of Historic places, and is visited sometimes by joggers who pass it on one of the running trails that wend their way through the woods that make up so much of the Academy grounds. There are three infant graves near the cabin from the Capp family that were distant cousins to Bill Burgess and who stayed there when times were really tough. There is a Burgess Road in the Black Forest, but that family was not related to Bill . Bill never got a road named after him. 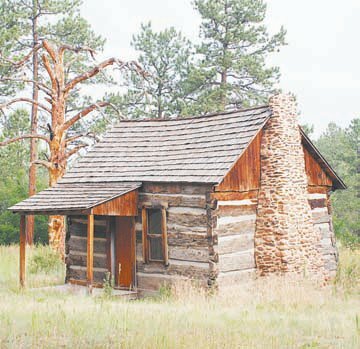 Only a lonely cabin which still stands in the wilderness as mute testimony to the very hard times some local pioneers had while Colorado was still just a Territory, Indians were a threat, and Colorado City was a struggling new town.